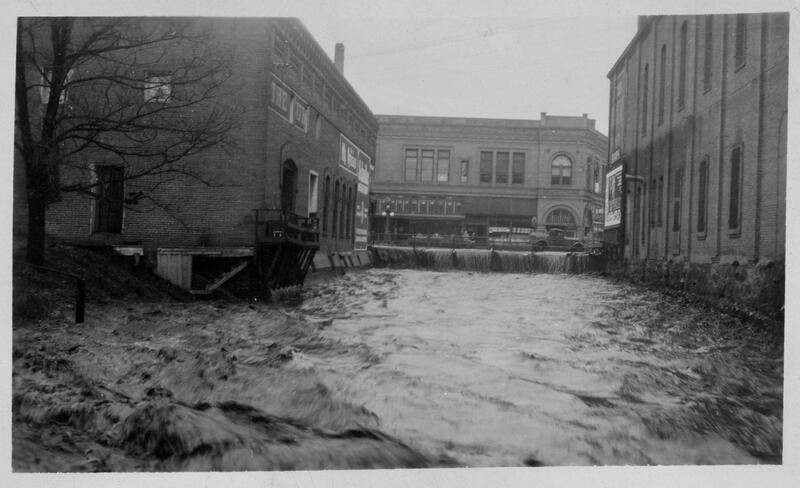 Water surges through downtown Walla Walla during the flood of March, 1931. Source:Walla Walla Flood Control Commission Photographs, 1931. The 1931 Walla Walla flood began a few months before with heavier-than-normal snowfall over Washington State. Normally, Washington winters end gradually, allowing melt water to be absorbed by the ground or flow to the ocean, but in early spring of 1931 the weather warmed suddenly. Dry Chinook winds accelerated the process, sending huge quantities of water into rivers and creeks downstream, causing many to overflow their banks. Such was the case with Mill Creek, which runs through the middle of the Walla Walla. The discharged waters quickly overwhelmed the capacity of the small creek, and there was nowhere else for it to go except through the downtown area. The effects were extensive: roads, bridges, and homes were damaged or destroyed, cars washed into fields, and stores and churches rendered inaccessible. The 45 photos in the collection document this destructive event that prompted to City to shore up its flood-prevention infrastructure and strengthen disaster recovery plans.